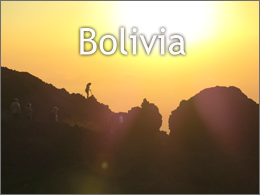 Description: Over 60 percent of Bolivia's people are Indian, mostly Quechua or Aymara, and many are subsistence farmers on the Altiplano (pronounced ahl-tee-PLAH-noh). With more than 30 official languages and over 36 native tribes, this program offers volunteers the opportunity to immerse in the country’s diverse indigenous culture, traditions, rural way of life, environmental beauty and significant archeological history while delving into the topics of sustainability, development, colonialism, globalization, tourism and cultural identity. While in Bolivia, students will be put to work on service projects ranging from Geo-Mapping to Sustainable Farming and have a unique opportunity to learn about development realities from experts in the region. The program is rounded out with visits to many culturally significant sites as well many opportunities to experience the overwhelming environmental beauty of the country which will leave all who come with a newfound understanding and appreciation for this amazing place! Service: Document and photograph Solidarity Tourism and Community-defined development projects including water systems, language schools, and cultural sites. Spend a day in the Rainforest Protected Zone working with indigenous population on a Forest Management Plan. Work on local farms to support sustainable farming projects. Work may include preparing soil for planting, planting, harvesting, and improving water systems. Help to create a grassroots geomapping matrix by documenting local municipal micro-initiatives. Education: Meet indigenous community members as well as local elected officials. Learn about geo-mapping from the ground up. Analyze the impact and implications of tourism and voluntourism while examining the effects of colonization and globalization on rural communities. Discover the growing decolonization initiatives of the indigenous peoples of Bolivia. Improve your Spanish speaking skills. Adventure: Visit the UNESCO Wolrd Heritage site of Samaipata, known also as "Little Machu Picchu" Shopping in local markets, participate in music and dancing, Tour colonial Jesuit Missions, epic hikes in the Andes, go Caving, explore the Dinosaur fossil sites of Toro Toro. Other extra optional adventures include: visits to the world’s largerst salt flat El Salar, Lake Titicaca and La Paz.